anatomical crown are frequently buried in gingival the variation in the tissue. As a person gets older, it becomes common for a tooth's enamel to be completely exposed above the gingiva and to have root surface showing (gingival recession). The term clinical crown is applied to the part of the crown exposed (visible) in the mouth. The root of a tooth is embedded in alveolar bone and is covered by cementurn. furcation. When a tooth has two roots, the root portion is said to be bifurcated. When it has three roots, the root portion is said to be trifurcated (fig. 4-5). If a tooth has four or more roots, it is said to be multirooted. The tip of each root is called apex. On the apex of each root, there is a small opening that allows for the passage of blood vessels and nerves into the tooth. This opening is called the apical foramen. The cervix or cervical line (fig. 4-4) is a slight indentation that encircles the tooth and marks the junction of the crown with the root. The cementum joins the enamel at the cervix of the tooth. The point at which they join is called the cementoenamel junction or cervical line. This section describes the histologic structures of enamel, dentin, cementum, and the dental pulp. Figure 4-6 illustrates the tissues of the teeth. Enamel is translucent and can vary in color from yellowish to grayish white. The different colors of enamel may be attributed to thickness, translucent proprieties, and the quality of the crystal structure and surface stains of enamel. The Root body and consists of approximately 96% inorganic minerals, 1% organic materials, and 3% water. Calcium and phosphorus (as hydroxyapatite) are its main inorganic components. Enamel can endure crushing pressure of approximately 100,000 pounds per square inch. A layering of the dentin and periodontium, coupled with the hardness of the enamel, produces a cushioning effect of the tooth's different structures enabling it to endure the pressures of mastication. Structurally, enamel is composed of millions of enamel rods or prisms. Each rod begins at the dentinoenamel junction (junction between the enamel and dentin) and extends to the outer surface of the crown. Enamel is formed by epithelial cells (ameloblasts) that lose their functional ability when the crown of the tooth has been completed. Therefore, enamel, after formation, has no power of further growth or repair. Figure 4-5. - Bifurcated and trifurcated roots. 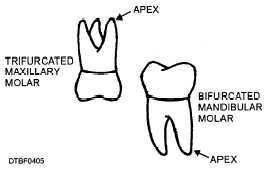 Dentin (fig. 4-6) is the light yellow substance that is more radiolucent than enamel and is very porous; it constitutes the largest portion of the tooth. The pulp chamber is located on the internal surface of the dentin walls. Dentin is harder than bone but softer than enamel. Dentin consists of approximately 70% inorganic matter and 30% organic matter and water. Calcium and phosphorus are its chief inorganic components. Dentin is a living tissue and must be protected during operative or prosthetic procedures from dehydration (drying) and thermal shock. The dentin is perforated by tubules (similar to tiny straws) that run between the cementoenamel junction and the pulp. Cell processes from the pulp reach part way into the tubules like fingers. These cell processes create new dentin and mineralize it. Dentin transmits pain stimuli by the way of dentinal fibers. Because dentin is a living tissue, it has the ability for constant growth and repair that reacts to physiologic (functional) and pathologic (disease) stimuli.